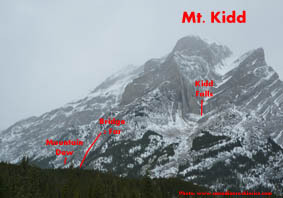 Approach: Park at Galetea Creek pullout (signed) as for Kidd Falls, 32.5km minutes along Highway 40 from the Trans-Canada. Overview of ice climbs on South West side of Mt. Kidd. 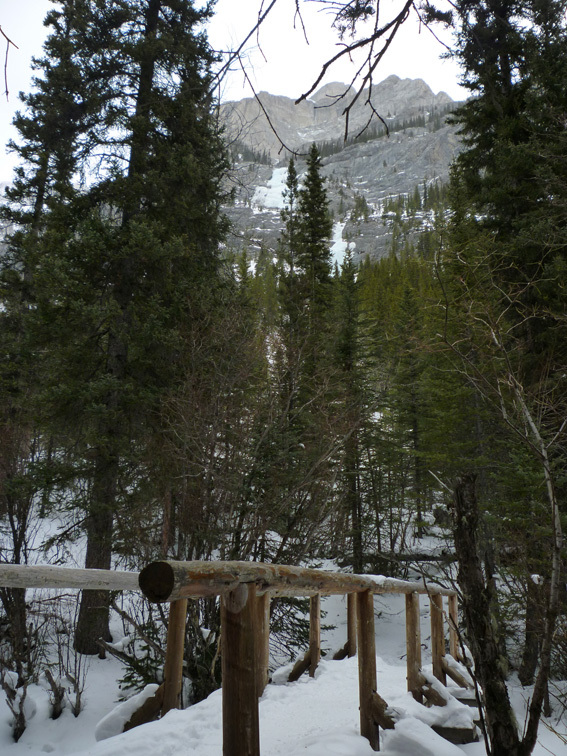 Follow the main hiking trail from the parking lot down and over a bridge crossing the Kananaskis River. Continue a minute further to the 1st bridge over the much smaller Galatea Creek. After crossing the bridge take the left turn following Galatea Creek (trail signs). Follow the well used trail for about 30 minutes to the 5th bridge across Galatea Creek (6th bridge of the day). The climb is visible in the avalanche path above. 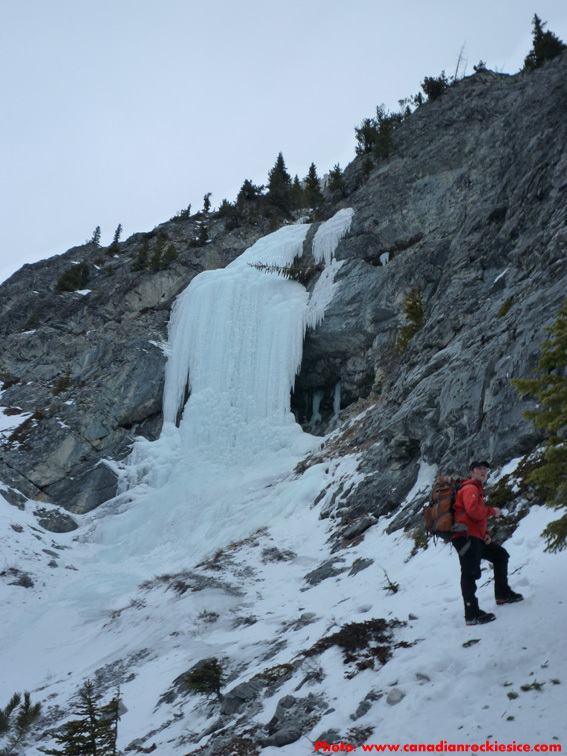 Hike up to the first pitch in another 20 – 30 minutes if travel is good. Looking up at the climb from the 5th Galatea bridge. Route Description: One nice steep 40m pitch at the bottom leads to a bolted anchor directly above or another on the left. Another 40m pitch of WI2 leads to tree belay. Walk up the gully for a couple minutes to the remaining 90m of WI2/3. If the bottom isn’t formed it is possible to scramble around either side to reach the upper climbing, but take your time to find a safe line. Some mixed climbs also exist behind the 1st pitch, see Mixed Climbs in the Canadian Rockies (Sean Isaac). Descent: Rappel the route using trees, V-threads and some bolted stations. Gear: Screws. Two ropes are nice for the descent. 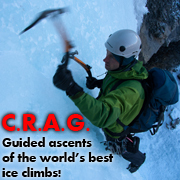 Objective Hazards: Avalanche hazard on the approach & from above the route. These cliffs get lots of sun so rock fall can be a problem on warm days.